There is an obvious power associated with racing and a certain environment too. The roar of the engines, the bustle of the pit crews, the waves of heat rising off the track’s surface and … the smell of cupcakes? 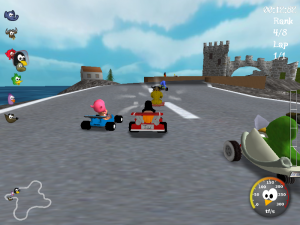 Super Tux Kart is a racing game which places cartoon creatures in go-karts and pits them against each other in a variety of tracks and challenges. It obviously falls into the same genre of silly, yet challenging, racing games such as Super Mario Kart and Wacky Wheels. And, while one could be forgiven as thinking of Super Tux Kart (STK) as a close relation to Mario Kart, it is very much its own game and features its own characters, items and many unique tracks. The characters, the drivers, in STK are all mascots of open source software, something which instantly appeals as this is itself an open source game. The karts all feature unique designs and characteristics. Some are heavier and can throw their weight around, others are small and bounce along the pavement willing to become air born at the slightest provocation. The tracks come in a wide range of styles and there are some beautifully crafted circuits in evidence. Some tracks resemble casual Sunday drives through the country, a few tracks are suspended in the air. There’s also map featuring a castle surrounded by lava, a track which takes us through an underground mine and one that takes us through a giant garden as if we were Alice in Wonderland. As we travel around these tracks we have the opportunity to pick up various objects which will assist us or hinder our opponents. We can collect and throw exploding cupcakes and bowling balls, drop sticky chewing gum on the track to slow other players and pick up fuel to make us go faster. Items generally provide small advantages and recovering from being hit by a high speed bowling ball is quick. This means that while the items are useful and can help a driver (especially one with good aim) the important thing is how well the player drives. An experienced player can often win without the use of power-ups or weapons. There are a number of aspects to this game I really enjoyed. The first, and most important, is it’s easy to just pick up and play without prior experience. To be honest I’m not very good at racing games in general and this one, while it rewards experience, is quite straight forward. A player can launch the game, drive with the arrow keys and work out things like item use, aiming and hand-brake turns later, if they wish. The game also comes with varying levels of difficulty ranging from very easy to slightly difficult. I wouldn’t say the game ever becomes seriously hard, but the player is welcome to add their own personal challenges, like abstaining from using items or giving AI opponents a head start. Another aspect of the game I very much enjoyed is its flexibility. Almost everything in the game is an option: the number of players, the tracks to use, how many laps to run, the screen resolution, whether to include power-ups, the quality of the AI… These are all options and the menu screen is easy to navigate. The game additionally comes with a number of different modes. We can run single races, perform in a series of races for points or engage in challenges. The challenges generally involve winning a race under certain conditions or collecting a given number of fuel capsules from around the track or finishing a race in a limited amount of time. The challenges slowly get harder as the player advances and I found them to generally be fun and having them adds a nice twist on the racing genre. A quick note on hardware. Super Tux Kart is probably the most advanced of the three games I’ve reviewed thus far. Still, its hardware requirements are quite reasonable. I was able to play the game with a 2GHz CPU and an integrated Intel video card and the game worked quite well under those conditions. On one track I did run into some lag when I had several AI opponents, but for the most part the game worked very well with my low-end video card. I have a lot of good things to say about STK – it has great scenery, fun characters, well considered power-ups, interesting challenges – and it took some time before I found things I didn’t like about this game. The big one is probably the camera. In the few racing games I do play I tend to prefer the camera stay directly behind and above the car. STK does this, but the camera behaves as if it was attached to the car via a rubber band. For instance, when we accelerate the camera falls behind a little, when we brake the camera zooms in closer. Some people may enjoy this and feel it makes the game more dynamic. (When I asked the developers about the camera behaviour I was told it was an often-requested feature.) I personally didn’t like the extra movement. It’s a small thing, but I found it distracting. The other thing is the AI appears to have very fast and fine-tuned car control. What does this mean? Well, practically it means if a player car collides with an AI-driven car the player car will probably spin out or get knocked aside while the AI controlled car will quickly recover and keep driving. It’s a known issue and I believe the developers are looking into balancing this aspect of game play. For now I found the biggest challenge of several of the more twisty tracks was to avoid collisions, after all, staying on the track is one of the most important rules of racing. My last complaint is with the helper balloon. (The what?) If the player drives off the track too far or falls into a lake, a balloon attaches itself to the kart and floats it back onto the course. The balloon can be summoned by pressing the “H” key in cases where it doesn’t come automatically, or fast enough. My concern with it is sometimes the balloon is overly sensitive. There were a few times when I was driving near the edge of the course, passing someone, and the balloon would swoop down and pick me up. On some tracks this happened whenever I got close to the side, on other tracks one could drive off and go for quite a ways without getting picked up. I’m not sure what governs the rescue balloon’s behaviour, but I generally found myself wishing it would only appeared when manually called. But these quirks and personal preferences aside, the key element of STK is that it is fun. The issues I mentioned above are relatively unimportant flecks of dust on a beautiful, well polished pearl. Super Tux Kart has an active community of kart and track builders, it has a friendly development team (which graciously accepted my patch for adding an option for camera behaviour) and, most importantly, the game has a lot of variety. This isn’t just a game one will play though once. With its many challenges, tracks, races and options it’s possible to play over and over again and have a different, pleasant experience each time. As I mentioned above, I usually don’t play racing games and even so if I’d been writing this column long enough Super Tux Kart would probably win my Game Of The Year award.